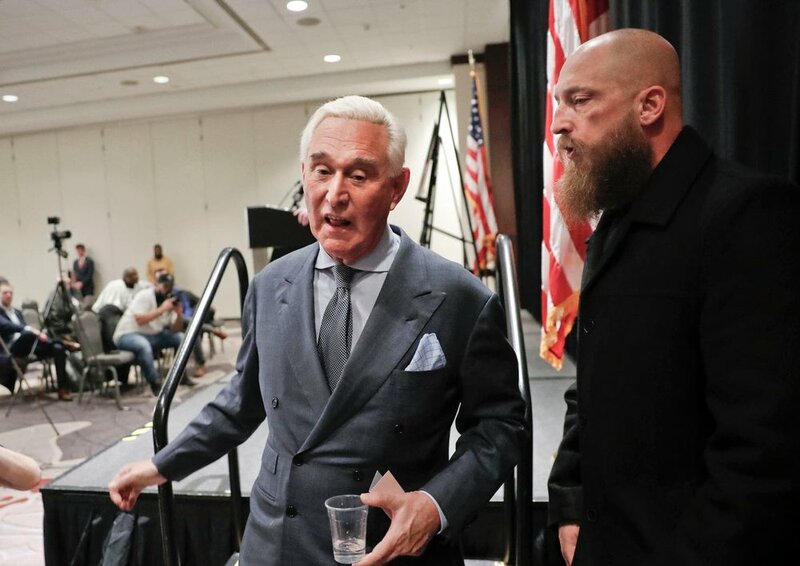 Roger Stone, a prominent Republican figure and self-described "dirty trickster", has been a strong force within presidential politics since the Nixon administration. Elected as president of the Young Republicans in college, Stone was a young and upcoming power in Washington D.C at the age of 25. Now, he is known as one of the closest officials to the Trump administration and the man most recently indicted in the Mueller investigation. Stone is a flamboyant character in politics and his personal life. He openly displays his political beliefs in a unique form, a large Richard Nixon tattoo on his upper back and his signature Nixon-era double peace sign pose. But beyond the oddly intriguing aspects of Stone’s personal life is a compelling story of an unrelenting political force, now at risk of a lengthy imprisonment. While Stone became deeply invested in politics early on in his life, his presence became all the more noticeable when he began working for the Reagan administration as a political consultant and lobbyist in 1976 and 1980. Later in the 80s, Stone formed a lobbyist firm of his own, Black, Manafort, & Stone. The firm cultivated an unsavory reputation throughout Washington, earning their name by working with shady characters in return for incredibly large sums of money. As a lobbyist, Stone began his descent into the deep, dark, unsavory political scene of Washington D.C.
During Stone’s tenure at Black, Manafort, & Stone, he met the young, wealthy socialite Donald J. Trump. Stone had always held great respect for Trump and urged him to run for president throughout the years. When Trump officially announced his candidacy in 2016, Roger Stone was close by as a top campaign official. Stone suggested that Trump take on Paul Manafort, his former colleague at the lobbyist firm, as campaign chairman. While Donald Trump was often the center of media attention throughout the 2016 campaign, figures like Roger Stone and Paul Manafort remained largely in the shadows, constructing the foundation for Trump’s campaign success. Stone’s recent indictment is due to his involvement in the release of thousands of emails from the Democratic National Committee onto the website Wikileaks in July of 2016. The leaks were intended to weaken Hillary Clinton’s campaign, which worked. Many voters felt as though Clinton could not be trusted or suspected that she was involved in criminal activity. Before long, the leak was proven to be a result of Russian interference. The suspicion then began to expand to the possible involvement of Trump’s campaign in the email hack, including Roger Stone. The FBI soon launched an official investigation led by former FBI director Robert Mueller into the possible collusion between Donald Trump’s campaign and the Russian hackers. And yet, it seems like there is finally enough evidence to prove Stone’s dirty reputation. In late January of 2019, Mueller released a 24-page document detailing Stone’s involvement in the 2016 email leak. Mueller asserts that, under the direction of a high-ranking Trump authority, Stone attempted to gather information about the release of the hacked emails. He then allegedly informed the Trump campaign about other possible future releases on Wikileaks. In further questioning, Stone attempted to obstruct the investigation through false statements and attempt to persuade false testimony from a witness. While it is unclear whether Stone had any direct contact with Russian authorities or hackers, his knowledge and suppression of the email leaks is in itself enough for an official indictment. As president, Donald Trump has surrounded himself with friends and associates like Roger Stone—‘Yes Men’ who unquestioningly support and protect the questionable actions of his administration. Men like Stone have built the foundation on which Trump’s presidency has thrived and come into existence in the first place. With the Mueller investigation revealing the collusion and deceit that characterized the 2016 presidential race, figures like Stone and Manafort face the destruction of their political careers, reputation, and lives as they know it. Stone’s indictment represents the downfall of a political powerhouse—a corrupt powerhouse—but a powerhouse nonetheless. Stone played a crucial role in creating Trump’s campaign and has remained one of the most prominent members of the Trump’s inner circle. Mueller’s investigation has shown no mercy and no fear—he will investigate anyone regardless of their status. As Mueller closes in on Stone, only one question remains— Who’s next?